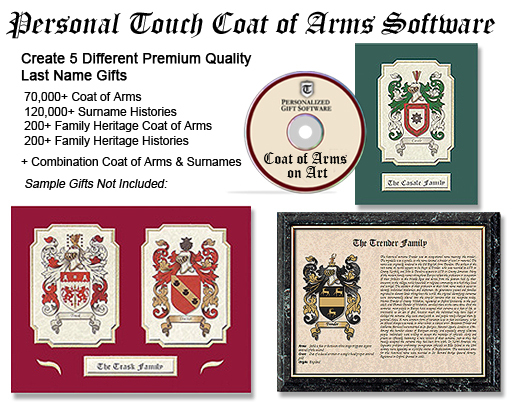 Coat of Arms Software by Personal Touch Products. 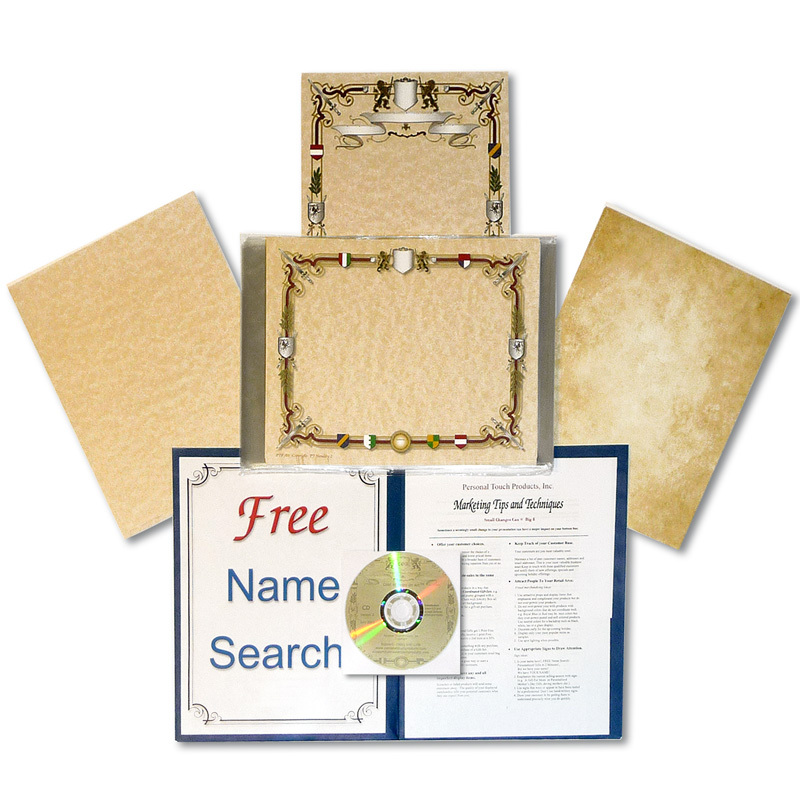 Create a large variety of family keepsakes with Personal Touch Coat of Arms Software. Family Heritage Gifts based on your customer’s country of origin. Create Last Name Keepsakes with our simple 5 step process. It takes less than two minutes to create high quality family heirlooms that your customers will cherish forever. Exclusive Coat of Arms graphics database. Premium graphics illustrated based on historical family Coat of Arms and Crests. Vector file format for the highest quality printing available. Each Coat of Arms graphic includes a Shield, Crest, and color coordinated Mantle. Each Coat of Arms graphic incorporates an eye catching 3D drop-shadow. Create Single COA gifts or Double COA gifts intended to pay tribute to both sides of the family that include the two family COA graphics printed side by side. Create a COA and SOA Combined. 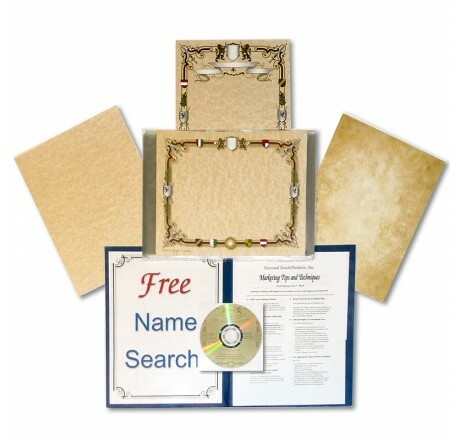 Create a keepsake with a Coat of Arms graphic and Last Name History on same printout. Create a Combined Family Heritage Keepsake that includes a Coat of Arms graphic and a unique family heritage write-up based on the family name country of origin. Create smaller COA gifts with preset sizes: 2x3, 4x6, 5x7, 8x10, 8.5x11. Drag and drop and resize COA graphics as desired. Edit surname text and save if desired. "Hi John, just a note about the COA update. My husband, son Scott and I did a one day street apple festival Saturday, first time I showed the combo gift. Close to 50% of the persons who looked at it bought for $12.00 printed on your parchment cardstock. Cut into my $20 mat sales. But was so quick and easy, we did not care. Day ended up at $1315.00 for 10AM to 4PM. The booth was jammed all the time. I tried to get them out the back onto the sidewalk with not much luck. Lost some business because they would not wait. We have another one this Saturday, it will be much smaller I think. Sally"
A color printer is required to print the Coat of Arms graphics. The printer should be capable of printing on 65lb card stock. We generally prefer laser printers but inkjet printers can work well also. We recommend testing your existing printer before making a new printer purchase. If you decide to purchase a new printer, select one that is designed to print on our thicker paper which is equivalent to 65lb cardstock or 100lb bond paper (the approximate thickness of a thin business card).